Beach towel There are 17 products. 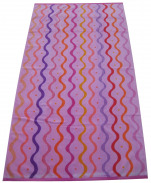 Beach towel, 100x180 cm, 100% cotton, 1 side with pattern and 1 other side white sponge. 1 side velor with patterned multicolored lines (red, pink, black, white, orange, purple, blue, green) and 1 side terry with the same pattern. Beach towel, 95 x 170 cm, 100% cotton, jacquard terry velor yarn dyed, (1 velor side and 1 terry side), 440 gr / m², aca coral lines. 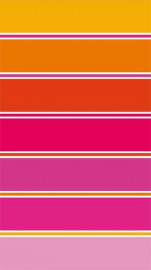 Colors on the beach towel: yellow, white, pink (fuchsia, mexican and raspberry), red (crimson and scarlet) and orange. Wash 60 ° C, dryer and ironing possibility terry side. 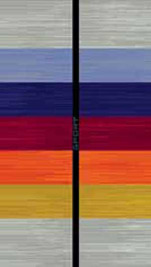 Beach towel, 100x180 cm, 100% cotton. 1 side velor with colors: gray, light blue, dark blue, red, burgundy, orange, yellow and white including amidst a black band with inscription "sport" and 1 side terry. 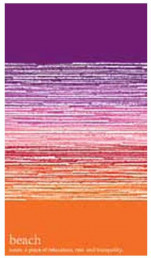 Beach towel, 100x180 cm, 100% cotton, purple pink orange beach. 1 side velor with colors: orange, red, raspberry, coral pink, fuschia, purple, mauve and white with white inscription "beach noun; a place of relaxation, rest and tranquility." and 1 side terry. Beach Towel / bath towel 100% cotton 102X178 cm. 1 face with multi colored lines pattern velvet and one-sided terry with the same pattern. Colors on the beach towel: purple, fuschia, orange, red, pink, coral, red and white. Embroidered inscription "Descamps" in the lower right. 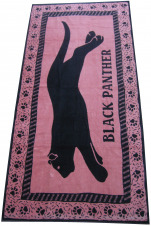 Beach towel 87x177 cm 100% cotton jacquard, velvet 1 black panther face with pattern on a pink background with inscription "BLACK PANTHER" black, black prints on the sides and 1 side terry pink panther pattern on black background with inscription "BLACK PANTHER" pink, pink footprints on the sides. Colors on the beach towel: pink and black. 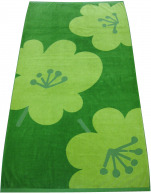 Beach towel 98x183 cm green flowers 100% cotton jacquard. A velvet face and a terry face. Beach towel 98X180 cm 100% cotton. Color streamer patterns with 1 face velvet pink background and 1 background color lined terry face. 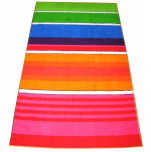 Colors on the beach towel : pink (fuchsia, salmon, coral), purple, red and yellow. Beach towel or bath towel 100X170 cm 100% cotton. Beach towel with 1 velvet face and 1 badstof face. Orange background with round pattern. 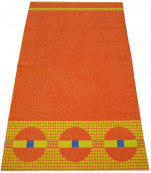 Colors on beach towel : orange, yellow and blue. 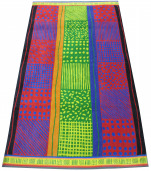 Beach towel 100x180 cm, 100% cotton jacquard. 1 velvet side with wheel, marine ropes and anchors boats patterned, and 1 terry side with the same drawings (switched colors). 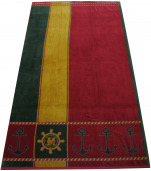 Colors on the beach towel: yellow (ocher), burgundy and green. Beach towel 100x185 cm, 100% cotton jacquard. 1 velvet side with lines, waves, circles, grids patterned, and 1 terry side with the same drawings (switched colors). Colors on the beach towel: green, yellow, red, blue, purple, orange, black and gray.